When I started my career as a freelance in the late 90s, I thought that working for myself would give me not only autonomy, but also more time to spend on creative projects such as writing. I was right about the autonomy, but very wrong about the spare time. The first couple of years I spent as a freelance I worked as a music journalist. I was very good at the writing part, but rubbish at the getting work part, and as a result I earnt around £8,000 over two years. Even back then, that wasn’t enough to live off and the financial trouble I found myself in killed my creativity stone dead for quite a few years. I diversified my skillset, got into web design and then social media, even before it was called that, and built my freelance business into a successful tech consultancy which still earns me the majority of my income. (And if you want to hire me, please do get in touch!) As I developed my freelance work, I also learnt how to be self-disciplined. I’ll admit that, in those first two years, I was a bit rubbish at getting stuff done, and even worse at pitching stories to editors. I always hit my deadlines, but it was often a last-minute thing and I rarely had my next commission lined up. Learning how to manage your time is an essential skill as a freelance, as there’s usually no one managing you, no one to make sure you’re on schedule, no one to help you make decisions and no one to check that you’re working on what is truly most important. In order to be successful, you have to learn how to prioritise, how to control your urge to skive off, how to be honest with yourself about how much work you’ve really done and whether it’s enough. In short, you need to develop your self-discipline learning how to prioritise your task list and then get on with the most important things first, whether you want to or not. So whenever you have client work to do, work that brings in money and pays the bills, that work tends to get prioritised over everything else. I do love it when I’m really busy and focused on one big project, because it means that I can blot out everything else from my mind and develop a form of constructive tunnel vision that is hugely satisfying. Unfortunately, that also means that other tasks get put to one side, even if they are important. That’s not so good. A side effect of being self-disciplined and focused on client work is that often, the first things to get put aside are the creative things, the blogging, the stories, the bookbinding. Whereas once I would have an idea for a blog post and then just write it, over the last several years I’ve developed the bad habit of having ideas and then thinking, “I don’t have time for this right now, I’ll write it when I have a moment”. Trouble is, those moments never come. Instead, the idea either gets forgotten, or, worse, written down on a To Do list where it can lurk at me and make me feel guilty about not writing it. Creative writing is even worse. I have ideas for stories, think that I need a bit of time to flesh them out but that I’ll do it on the weekend rather than right now, and of course the weekend gets filled up with chores or social outings or the gym or work. I do jot them down, but again, they just lurk at me and never get the time or attention they need to blossom into something writable. Humans are very adept at learning, even when we don’t realise we are, even when we don’t want to. We might think that we’re in control, but our cats train us just as much as we train our cats. And we are more than capable of training ourselves without even realising it. Tell yourself that you’ll think about this story idea later, and soon enough your brain won’t bother telling you that it’s had an idea. After a while, you’ll forget that you’re even capable of having ideas, and they’ll dry up all together. The self-discipline that keeps business moving onwards is the same self-discipline that kills your creative life stone dead. Self-dicipline is the mind-killer. At the root of this problem is the failure to align and integrate long-term goals with short-term needs. This is a problem I see a lot with my clients: They are so busy trying to deal with all the urgent stuff that’s screaming for their attention that they have no time or space to think about long-term planning and strategy. They’re too busy reacting to the now to invest resources in the future. The same is true with our creative lives. We’re often too busy meeting our short term needs to be able to commit the time and resources required to reshape our future. This is especially the case with creative writing. Novels take a lot of time to write, edit and perfect, and the return on that time investment is uncertain at best. If you have a job and clear work-life boundaries, it’s easier to invest some of your personal time to your writing career, but it becomes difficult when those boundaries are blurred, as they so often are for the self-employed. But “A-ha!” you might say. “All you have to do is turn this much vaunted self-discipline to your writing and bingo! Problem solved!” That is, however, the wrong starting point. The first thing to do is to recast writing not as a hobby or a lottery ticket or as a labour of love, but as work. It is work in the same way that doing the accounts is work, or doing marketing, or going to conferences. It may not pull in money directly, or at least, not to start with, but if you’re serious about becoming a full-time author, as I am, it is essential to commit time to doing it. It is an investment in your future. I’ve had some luck with this approach in the past, but it can be hard to keep up. The first big client deadline results in the writing and blogging being put on the backburner as priorities shift. Often, though, they don’t shift back again when the deadline passes. The commitment to my writing is, after all, to me and not to an external party who has expectations. It is easier to prioritise external demands over internal desires, and so once again, the balance between client work and writing tips in the wrong direction and it gets harder and harder to get the scales level again. Complicating matters is the fact that income from writing is unpredictable and patchy. 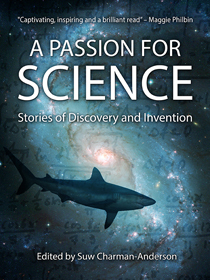 I’ve done well the last few months with the sales of A Passion for Science, the Ada Lovelace Day anthology that I put together. That was only possible because of the generosity and kindness of my contributors, though. My fiction has done less well, not least because I’ve not had much chance to write, so haven’t put new work out, so sales have just fallen off a cliff. It’s a catch-22 in some ways: I could write more if my writing income were higher, but it won’t get higher unless I write more, so we’re back to prioritising the future. This all leads me to wonder whether using a service like Patreon.com would be a good idea. In short, readers commit to paying a small amount on a regular basis if (and when) I produce a new story, novel chapter, etc. If I had a commitment to keep, and a commitment that involved money, perhaps it would be easier for me to re-catagorise and prioritise my fiction writing as ‘work’. So, what do you think? Is the Patreon model a goer? Would you be up for it? Let me know what you think! Hi Suw, an interesting read, am taking a look at patreon.com at the moment but just to let you know the link to patreon.com is broken. Thanks for letting me know, Scott. I’ve fixed it now! Previous post: 2014: A year of massive change?